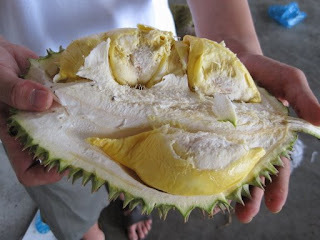 These are some of the varieties of durian that you will find at the Bao Sheng Durian Farm in Balik Pulau, Penang. Many Malaysians can't get enough of it yet there are also those who can't stand it. It is that overpowering smell, they say. Yes, it is a complex relationship. 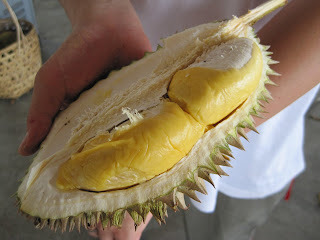 Find out more about the Bao Sheng Durian Farm tomorrow. 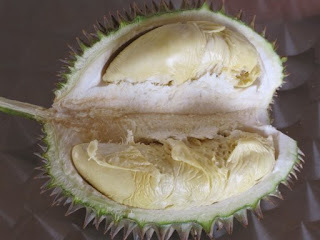 The thing about durians for those who like them is that once one starts devouring the luscious flesh, it is difficult to stop even though one knows that too much of this good thing can make one unwell. 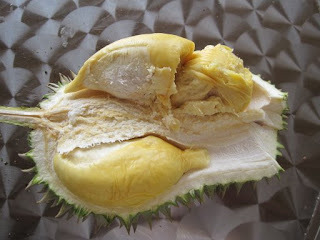 My mom used to limit me to no more than one durian per day, for my own sake! Your mum is wise! I wish I could be so disciplined!!! I meant one whole fruit, not just one seed. But then, looking at the pics you posted, i'd probably find that even one whole fruit would not be enough!